In 1940, Cuban President Fulgencio Batista was elected as president. By 1952, Batista took nearly complete control of the government. As a result, the 26th of July movement arose. Led by Fidel Castro and other communist influenced figures, they rebelled against the Cuban government. This would shape the history of Cuba going forward. However, Castro’s success was not immediate. It came slowly through the building of a foundation of support that would see him through many difficult days. By inspiring those around him in his earliest days, he planted the seeds of the revolution that would eventually see him rise to power in Cuba until his death. 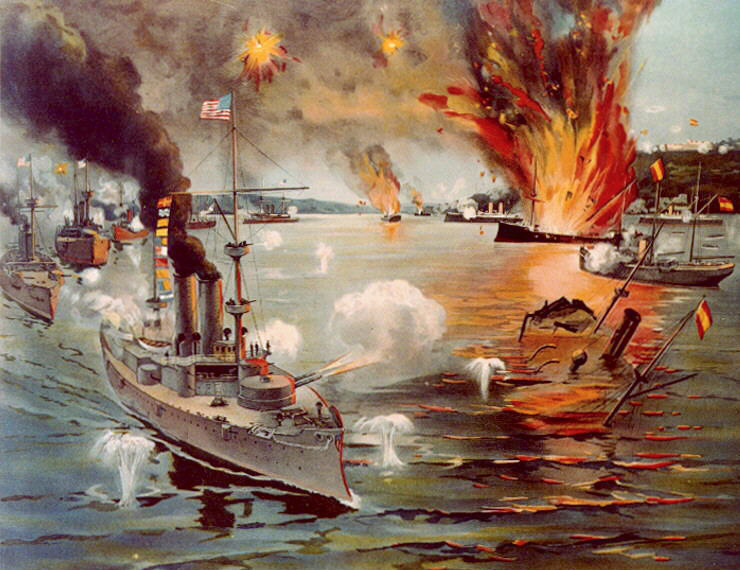 In January 1898, the mysterious explosion that sunk the USS Maine in Havana harbor and blame for the event was placed on Spain. ‘Yellow Journalism’ raised public support against the Spanish claiming that they occupied Cuba without sufficient reason. 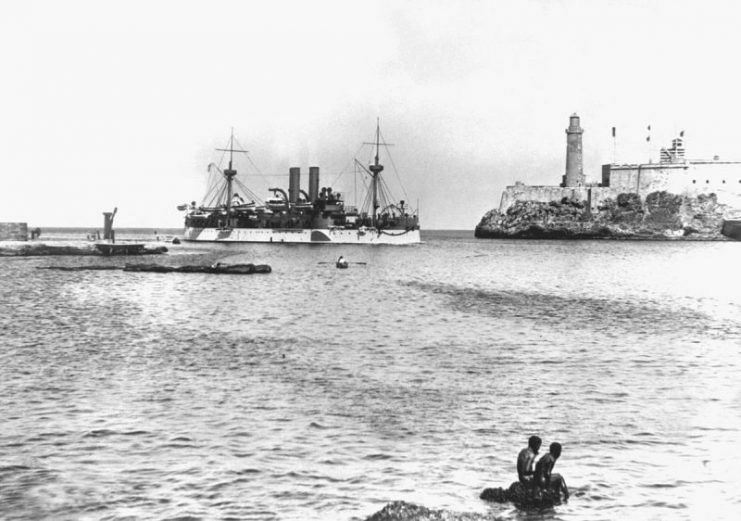 USS Maine entering Havana Harbor on 25 January 1898, where the ship would explode three weeks later. On the right is the old Morro Castle fortress. No one knows, even to this day, what caused the explosion, but popular rallying cries encouraged war with Spain with such phrases as, “Remember the Maine! To hell with Spain!” Congress urged President Mckinley to use military force against Spain and to free Cuba. On April, 21th, 1898, the US Navy blockaded Cuba. The US asked Spain to give up Cuba, but they were ignored. The Navy destroyed the Spanish fleet in the Pacific and Spain capitulated. During this ten-week war, Spain experienced a cultural revolution as artists, writers, and intellectuals began to reevaluate the policy and to question Spain and its role as an imperial power. The Battle of Manila during the Spanish American War. Spain was constantly gasping for air as it faced many wars and other problems throughout the 19th century. Spain was on its knees as it struggled to consistently maintain control over its colonies. The Spanish-American war officially terminated the Spanish Empire for good. Theodore Roosevelt, who famously led the Rough Riders in the invasion of Cuba, became president 3 years later. He famously inspired the Big Stick Ideology as an addition to the Monroe Doctrine. This declared that the US would police the Americas against European Colonialism, not only by its policies, but by its actions. As Cuba was declared independent, the United States occupied Cuba until President Theodore Roosevelt requested that the Army should be evacuated due to the yellow fever outbreak and the ratification of the Platt amendment. 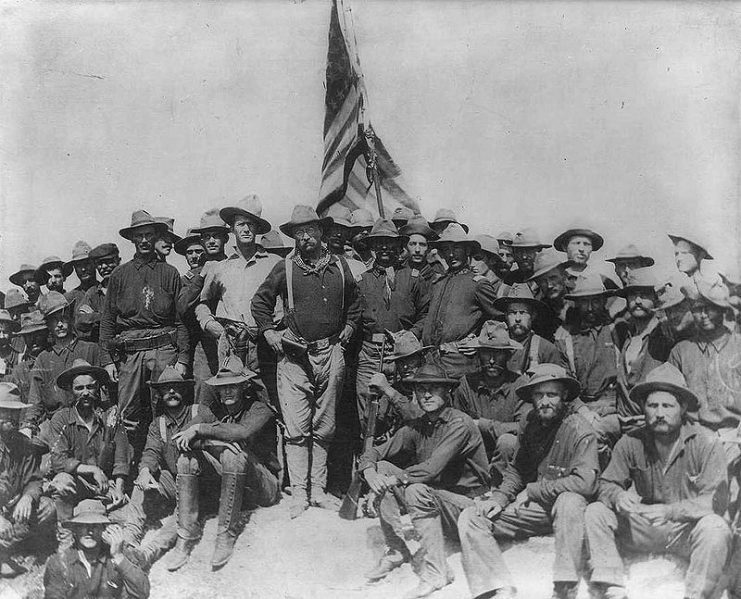 Teddy Roosevelt with the Rough Riders, 3rd Volunteers, and Army 10th Cavalry at Kettle Hill in Cuba. Cuba was recognized as a fully independent Republic by 1908. Tomás Estrada Palma became the first Cuban president under US occupation. José Miguel Gómez became the second president of Cuba in 1909 after an election. He was a strong supporter of the Platt amendment, which saw the withdrawal of US troops. He was succeeded by Mario García Menocal. The last president of pre-communist Cuba was Fulgencio Batista. He served a term from 1940 to 1944. After losing the preceding election, eight years later he led a military coup in 1952. He subsequently formed a new government with him at its head. 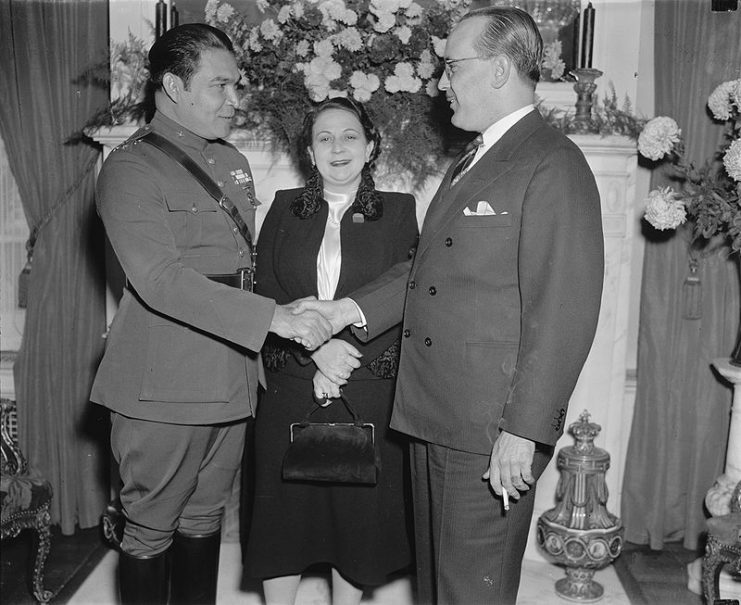 Batista, his wife Elisa, and Cuban ambassador Fraga in 1938. In response, the 26th of July movement, led by Fidel Castro, was formed. After experiencing the brutality of the police, poor infrastructure, no health care, and no educational rights, many Cubans joined the revolution. Castro’s brother Raúl then formed the paramilitary group called “The Movement,” known in Spanish as “El Movimiento.” They recruited over one thousand followers by the end of 1952. On July 23rd, 1953, 69 fighters led by Fidel and his brother Raul, attacked the Moncada Barracks of Batista’s regime. The attack ended in defeat for the revolutionaries. As a result, nine died in battle and the other 56 were executed by the Cuban government. 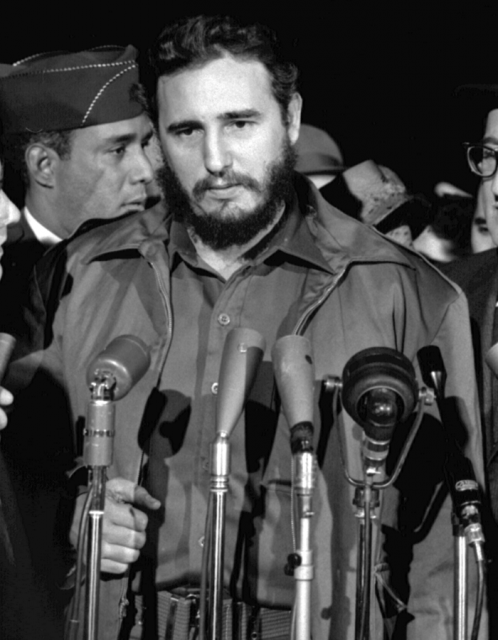 Fidel, who was already an experienced lawyer, stood in his own defense in the trial. He had a four-hour long speech in which he famously stated, “History will absolve me.” In the trial, he accused Batista of tyranny and declared that he should be overthrown. He also stood for the people of the poor working class. The court, however, decided not to take legal actions against Batista. Fidel was sentenced to 15 years in prison. 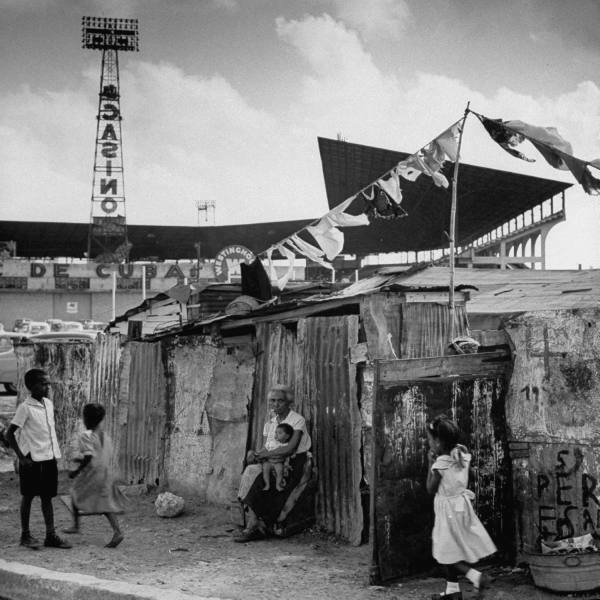 Havana Slums in 1954 near the baseball stadium and advertising for a casino. In a BBC interview following Castro’s death in 2016, he said that in prison he would “Spend hours reading books.” After a few years in prison, the Jesuit teachers of Fidel’s childhood finally convinced Batista to release Fidel and other key figures of the 26th of July movement. They were then exiled to Mexico. The Castro brothers and the other exiles then prepared to overthrow Batista. 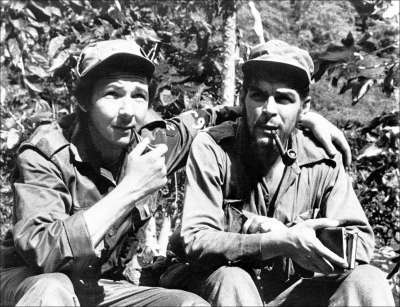 They recruited more members, including Ernesto “Che” Guevara, an Argentine. They were all trained by Alberto Bayo, a former Spanish Civil War veteran and Guadalajara Military Academy instructor. They were taught military and guerrilla warfare tactics. On November, 25th. 1956, the yacht “Granma” transported the Castro brothers, Guevara, and other Cuban revolutionaries to La Playa de Los Colorados, Cuba. The yacht, originally meant to carry 25, held 80 passengers. They landed two days later than they planned because of the overcapacity of the passengers. Once they came ashore, the band of rebels made their way into the Sierra Maestra mountains. Three days later, the rebels were ambushed by Batista’s army. In the aftermath, only twenty survived, including the Castro brothers and Che Guevara. The survivors were dispersed into the mountains and proceeded to search for each other. However, they quickly linked up were joined by peasants who were ready to fight Batista. Other revolutionaries, including women, then helped to regenerate a guerrilla army. In addition, a Catholic student group, Directorio Revolucionario Estudiantil (DRE), also took up arms against the Batista regime. While the mountains were under Castro’s control, rebels used the radio to broadcast their message to the Cuban people in response to Batista paying the Cuban press to say Castro was dead. Even though Castro’s men numbered less than 200, Batista’s force of 37,000 was weakened by an arms embargo. Starting in July 1958, Batista sent his untrained army into the mountains to end the rebellion. 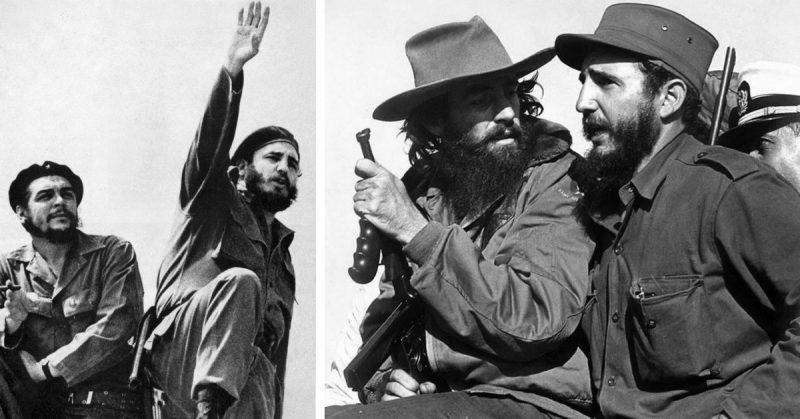 However, Castro and his men were able to continually defeat Batista’s soldiers. In the final rebel skirmish on December 31st, 1958, in the Battle of Santa Clara, Cuba finally fell under rebel control. 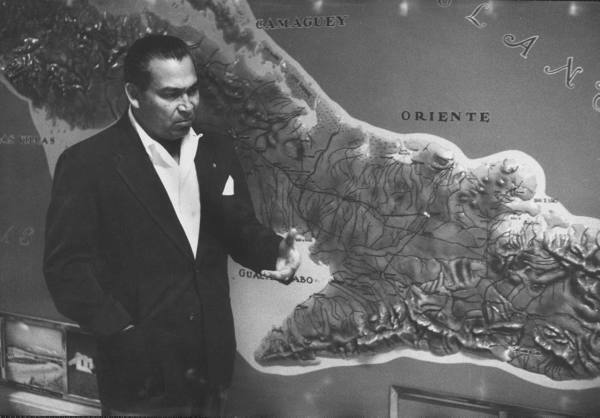 Batista, hearing of his defeat, fled Cuba by air to the Dominican Republic. On January 3rd, 1959, Manuel Urrutia Lleó became the appointed president of the new revolutionary government of Cuba. 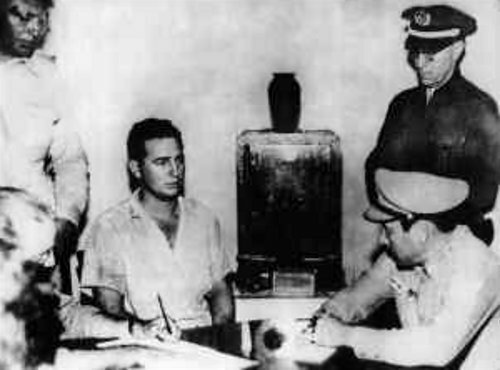 The police and soldiers of Batista’s regime were then put on trial for war crimes and human rights violations. As a result, many were executed by firing squad and the others were sent to prison. The new government present a program of social reform. The new revolutionary Cuban government instituted racial equality, improved women’s rights, and gave greater access to the education system. 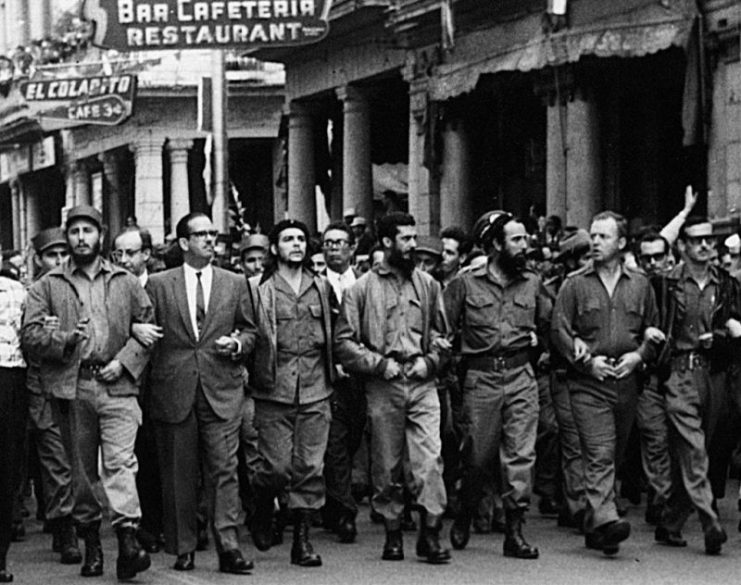 Fidel Castro (far left) and Che Guevara (centre) lead a memorial march in Havana on 5 May 1960, for the victims of the La Coubre freight ship explosion. The new revolutionary government nationalized all private property and declared itself an atheist nation. In April of that year, Castro visited the US and told the press that he was not a communist as the world believed. However, due in part to the US embargo on Cuba, Castro sought help from the Soviet Union. This relationship would create further challenges for Cuba, the Soviet Union, and the U.S. during the Cold War.